So what’s the difference between a pop-up and a coffee cart or kiosk? For starters, pop-ups are temporary, but they also tend to be countercultural in their approach. “ ‘Pop-up’ is a loose term for a temporary setup that is done under the radar,” says Lim. “It’s kind of a guerilla approach to serving the public without the conventional advertising and signage.” They’re designed to deliver expertly brewed coffee to the masses with little start-up time and without much up-front cash—unlike, say, a coffee truck, which can require a decent investment between buying, repairing and building out a vehicle or trailer. Pop-ups are generally spare and slim by design, made to be easily broken down and moved to a new location on a whim. While the oddball factor of a here today, gone next month coffee bar might seem impractical for many entrepreneurs, it’s also become an ingenious way for some not-yet-opened businesses to start creating a buzz while they ready their permanent digs. Stumptown Coffee and Danny Meyer’s Union Square Hospitality Group ran a pop-up in the Whitney Museum in New York this winter in order to hold over thirsty art-lovers while USHG prepared its permanent café, Untitled, in the museum. And in Oakland, California, Heather Sittig ran a pop-up coffee bar in front of the space she and her partners were readying for their new restaurant, Toast Wine Lounge. Where some pop-ups excel is in the business of brand blitzing—when a company that’s got some cash to throw around wants to extend its image and uses the smell of coffee to lure in new customers. For a month in 2007, the international coffee company Illy parked a fully functional, modern shipping-container home inside New York’s Time Warner Center in an effort to market the company’s Hyper Espresso system. But Humberto Ricardo, co-owner of tiny, two-year-old Third Rail Coffee in New York’s West Village, had a different experience. 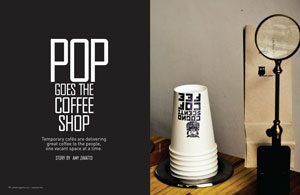 Last summer, he and partner Rita McCaffrey ran a three-month-long pop-up that bordered on the meta: a temporary coffee bar that existed within another pop-up done by London-based cycling-gear outfit Rapha. “Obviously, they wanted to develop brand awareness, and since traditionally there’s been a strong hook between cycling and coffee, it made sense,” says Ricardo. Another example of pop-up goodwill is the summer-long stint that Stumptown founder Duane Sorenson put together in Amsterdam last year. In his frequent layovers in the city during sourcing trips to Ethiopia, Sorenson had never found the kind of coffee he wanted. He was approached by the Montreal-based advertising agency Sid Lee to do a three-month pop-up after the agency opened a studio in Amsterdam. Sorenson sent over his own baristas and a steady supply of beans (roasted at Stumptown’s New York roastery), but there wasn’t much else he had to do. “One side was the design studio, and in the back of it was a sort of private space where they already had their own personal coffee bar set up,” says Stumptown’s Matt Lounsbury. The bar had a street entrance onto the busy Albert Cuyp Market, so foot traffic wasn’t an issue. Stumptown secured a loaner espresso machine from La Marzocco, the Sid Lee folks decaled the back wall of the space with their own interpretation of Stumptown’s logo, and they were up and running. The American whiskey landscape simply wouldn’t look the same today without his influence.